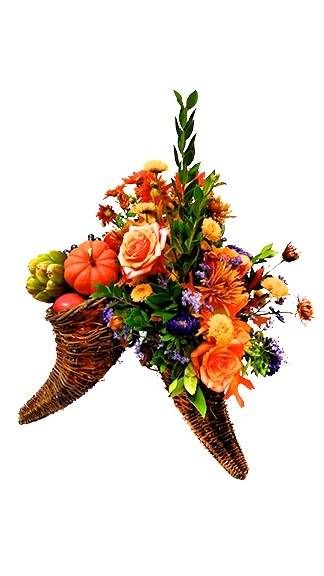 The Thanksgiving table design is what finishes the tablescape, for an event, gathering of friends and intimate meal. The table looks lovely until the food comes out-then the flowers are taken off and set somewhere. This year, place 4 of your pedestal glasses drinking side down on the table, set a cookie tray, pizza stone on the glasses, cover with a matching napkin, something to blend into the scape. Set the flowers on the top of the tray. You will have room for the food and the beautiful arrangement. Cornucopias are traditionally the table centerpiece of choice. This design is putting a twist on the traditional, while still keeping it. Take three cornucopias and attach them together with wire to form a tripod standing on each curved end. One open end can be filled with fun fruits, candy, little gifts, nuts, berries; the second with a seasonal or green plant and the third with fresh flowers and foliage. Permanent botanical flowers and foliage are an option, as are dried. Put the same in all three, mix and match as your creativity soars. 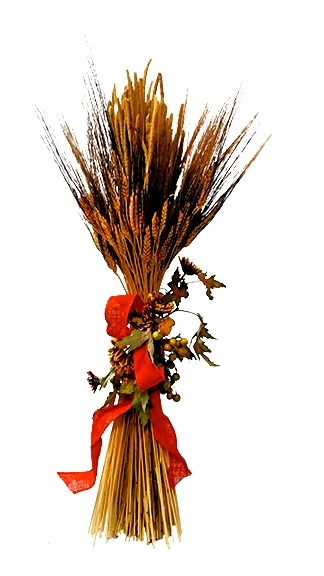 Wrap the wheat stems around the other grain stems. Twist into a spiral, tape in place. Cover tape with a ribbon, loops and streamers. Wet and tie the “Mini Deco Holder’ secure on sheaf with glue or use the ribbon openings. Insert small stem flowers and foliage into the mini décor holder for final touches.